Golden healer and white Arkansas rock crystal cluster has three diamond window points - one is an extremely rare 8h faced crystal, too - several uncommon 7h faced crystals, a centerpoint [merlin] crystal, rainbows, record keepers and a rare multi-colored iris or two as well. 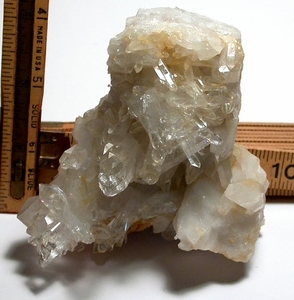 4-1/2" at its' widest x 3-1/2"x 2-1/2" tall, there is a thin grey sandstone 'rind' under a milk quartz matrix supporting golden healers at two edges which show off excellently clear crystals in the center. Two starbursts with doubly-terminated penetrated crystals to 1-3/8" flank a quad crystal of 1/2"x 1-3/8". The center of one starburst is in regrowth; in the other, a missing facet which does not detract.